A brief synopsis – Andy recommends that all the sales reps team up for sales calls so, invariably, he is able to go on a call with Michael. Dwight arrives late to the sales meeting because he had secretly gone to New York to drop off some papers that Angela forgot to sign. Phyllis and Karen find success on their trip, as do Dwight and Jim. Andy messes up the sale for Michael and Stanley leaves Ryan out on his own, where he fails miserably. Andy recovers evidence that Dwight has gone to New York which he presents to Michael, who follows up with some confirming evidence of his own. Enraged, Michael confronts Dwight, who will not reveal what he did for Angela, as they have not gone public as a couple. Michael gives Dwight until the end of the day to decide what he is going to do. Dwight quits. Meanwhile, Karen, having found out about Jim’s crush on Pam from Phyllis, at first denies it, and then admits it, but plays it off like it is over. The best line – Harvey (Michael’s computer): Pam, you look very hot today. Jim: Pam, meet Harvey. This is Michael’s new friend. Michael: Oh, that is gross. Pam: Who is ‘Long Tim’? Jim: Oh well, ‘Yoy’ should bring in ‘Long Tim’ in one day. Shouldn’t he? Pam: I would love to meet Long Tim. Harvey: You ruined a funny joke, you. Get out of my offize. The best moment – Dwight pulls a “That’s what she said.” on Michael at the worst possible moment. The best storyline – This is a great episode, but it is Dwight and Angela who steal the show with their honor for each other. Notable guest appearance – Harvey the computer, and all of those customers on the sales calls. Would Michael have been reprimanded? – Likely not, but there would have been an issue with the top salesman in the company up and quitting. This is a great episode and the fact that it took 3 writers is at once not surprising and amazing for how cohesive it is. Angela is in top form, Andy will never be more evil, and Dwight will never have more honor. Michael is superb here too. The office visits allow many cast members a chance to shine. 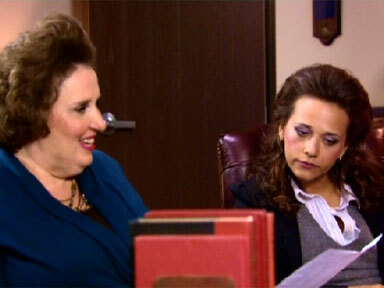 Phyllis shows some insane chops above and still manages to get Karen to pay for an unwanted makeover. Stanley just wallows in Ryan’s misery. Michael has no sales peer, but Andy is a surefire antidote. Jim’s phone call to Kelly on his and Dwight’s sales call was sublime.